This handy reference guide is packed with all the info you need to stay alive and well in the field, including disease diagnosis and treatment, drugs and dosages, emergency paramedical skills and preventive medicine. 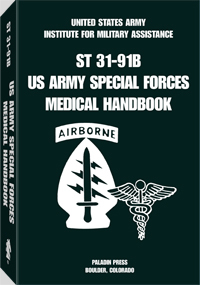 Special sections cover wartime emergencies (burn and blast injuries; nuclear, biological and chemical warfare; and emergency surgery) as well as primitive and veterinary medicine, obstetrics, pediatrics and orthopedics. Also includes practical survival techniques.